Seriously, I don't really know why are we eating these ultra black breads. All because it is a trendy Asian food to eat??? I hope that you have not rolled your eyes on me! LOL! Accordingly to Wikipedia, bamboo charcoal is made by burning bamboo that are five years or older in an 800-1200°C oven. What is the use of making bamboo charcoal? Well, most Asians believe that bamboo charcoal has excellent absorption properties and can remove bad odour and organic impurities. You know... Like any charcoal, bamboo charcoal is also commonly used to purify water. 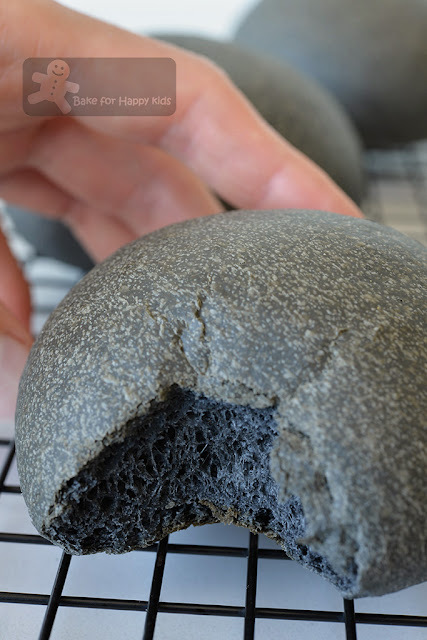 I have seen and tasted many bamboo charcoal bread in Asia before but really ONLY A FEW are soft and moist enough to impress me! And I wonder why... Why are most charcoal bread dry and too hard to chew? 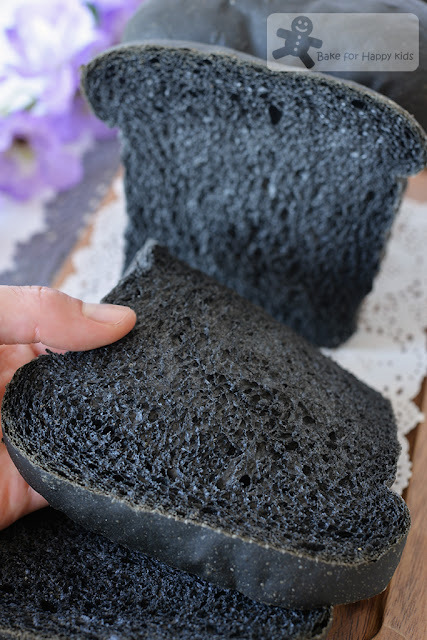 No doubt that it must be the excellent absorption properties in bamboo charcoal that absorbs the moisture from the gluten making the bread tougher than usual??? 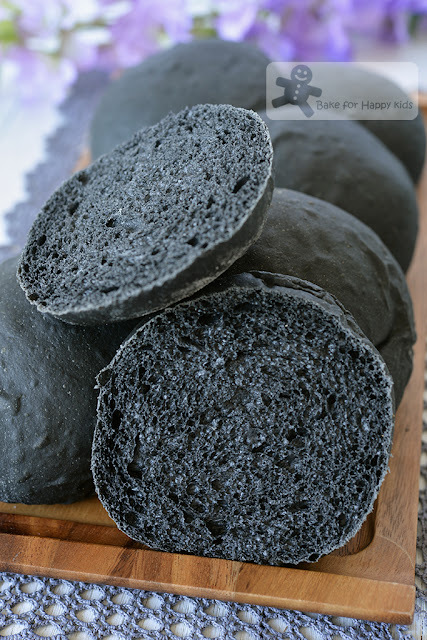 For this reason, I clearly know that bamboo charcoal is a challenging ingredient to incorporate into bread. I know some of you might ask... Where can you buy bamboo charcoal powder? I bought mine from Singapore. What if you don't live in Singapore? Or won't be going to Singapore? No worries! 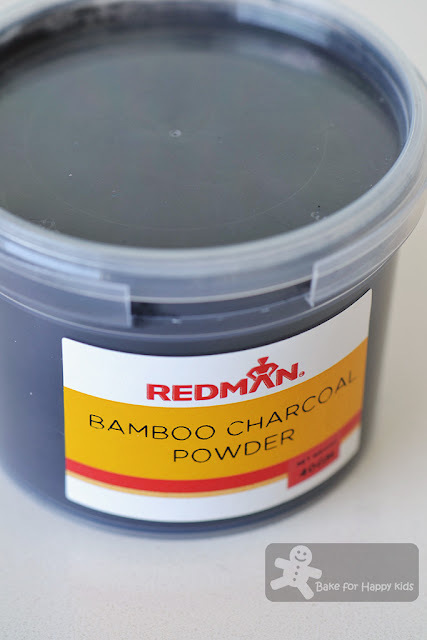 I have been Googling and found that you can buy bamboo charcoal powder via online shops like eBay and Amazon. This is the bamboo charcoal powder that I bought from Singapore. Prior baking this recipe, I have tried several recipes that are rather disappointing. Although charcoal is good at absorbing water, it is also hydrophobic! Due to this reason, some recipes use high amount of fat like cream and butter to incorporate charcoal more effectively into the bread dough. For example... these charcoal burger buns that were made with cream (shown in the following two photos) were soft when they were freshly baked but within the same day of bake, they toughened up very quickly!!! Although warming the bread in the oven can help to soften the bread again, the fussy me still think that they are not good enough and never as soft as they were freshly baked. Bamboo charcoal burger buns that are made from a not-so-ideal recipe that contains cream. Soft...only when they are freshly made! 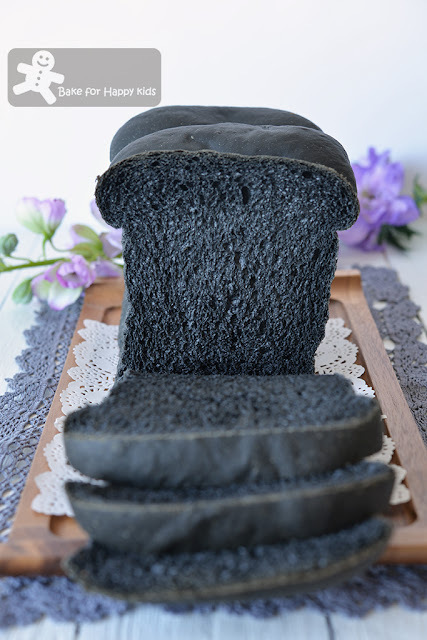 Thus, I have learned that the use of high amount of fat like cream and butter won't help to incorporate more charcoal powder and moisture into the bread dough. Instead, I have decided to over-load my bread dough with moisture and refuse to use milk and cream to make my charcoal bread!!! Why? Based on my blog post at here, I know that the enzymes in fresh milk and cream can break down gluten and prevent the bread dough from rising. This unbeatable moisture-overloading charcoal bread is so soft, moist and lovely! "Mmm... Mum! You must save this charcoal bread to make my school sandwich!" said my son after having his first bite of this charcoal sandwich bread. And, my husband kept saying... "Got standard! Got standard!" And of course, I'm happy hearing these. LOL! Like this recipe? 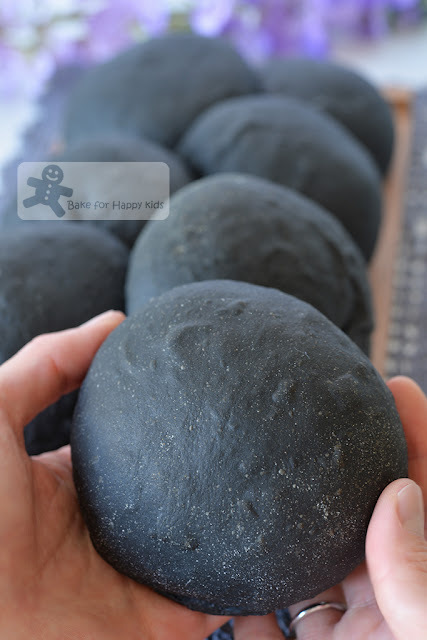 You might be happy to know this is also a good recipe to bake charcoal burger buns too! For sure, these charcoal burger buns are NOT disappointing!!! ...because they are so soft and moist! I would highly recommend this recipe! Will you? "Thanks Mum! I love my charcoal bread sandwich!" "I'm happy that you like your sandwich. What did your friends say anything when they see you eating these black bread?" "Yeah... They laughed hysterically saying that my mum had charred my sandwich bread so badly!" "Did you try to explain to them that these are charcoal breads?" I laughed when I saw a cheeky smile on my son's face. WARNING: This bread dough is fully loaded with moisture and will be sticky and difficult to handle! Please use a breadmaker or an electric mixer with hook attachment for kneading and do not knead the dough by hand. You will need extra flour for dusting but it is important to resist using too much flour while shaping the dough as the increase of flour content might toughen the texture of the finishing products. If you are using an electric mixer with an hook attachment to knead, combine all ingredients except butter in the mixing bowl and mix at low speed until a soft dough forms. Then, knead in the butter until incorporated. Continue to knead at low speed for at least 25 mins or until the dough is smooth and elastic. It is important that the dough has to be elastic and stretchy. Cover the dough and allow the dough to prove in a warm and humid place for about 1 hr or until doubled in size. Grease 10 x 20 cm loaf pan/s with butter or vegetable oil spray. If you are making two loaves, divide dough into into 6 equal portions. If you are making one loaf and 8 burger buns, divide dough into two equal portions and divide one portion into 3 equal portions and divide the other half portions into 8 portions to shape the buns later. Shape each portion of dough into smooth balls. Allow them to rest at room temperature for about 10 mins. Place three rolled dough with their seams side down into each prepared pan. Press the top of the dough lightly to form an even surface. Allow the dough to prove in a warm and humid place for another 1 hr or until the dough is going to reach the maximum height of the loaf pan. Line baking trays with baking paper. Gently deflate the dough and divide it into 8 or 16 pieces depending on the number of buns that you are making. Shape each piece into a round smooth ball. Arrange the shaped dough with about 5 cm apart on the prepared baking trays. Cover the dough with cling wrap and allow them to prove in a warm and humid place for another 1 hr or until doubled in size. Bake bread in a preheated 180°C (350°F) oven for 12 mins for the buns or 25 mins for the loaf /loaves or until the bread are thoroughly baked. Remove bread from the loaf pan or baking tray and transfer them immediately onto a wire rack to cool completely before serving. I love the softness texture of your bread. Can I just leave in the bread maker to bake instead of baking in the oven? Tks. that really is one black bread LOL!!! very curious about how it tastes. Sorry, Zoe, overlooked the recipe earlier & noticed can use breadmaker. Thank you. Just stunning! I can imagine those buns filled with salted egg yolk and there you go! One of the craze trending food items we can't get enough of! Hi, I normally don't do the second fermentation of my bread overnight and you are right that it will make the bread taste very yeasty if you over-prove your dough. I’m looking to buying so I can make bread.. They sell lots of it here in Canada but says it’s for skin, brushing teeth and making soap.. How could one purchase from Singapore? 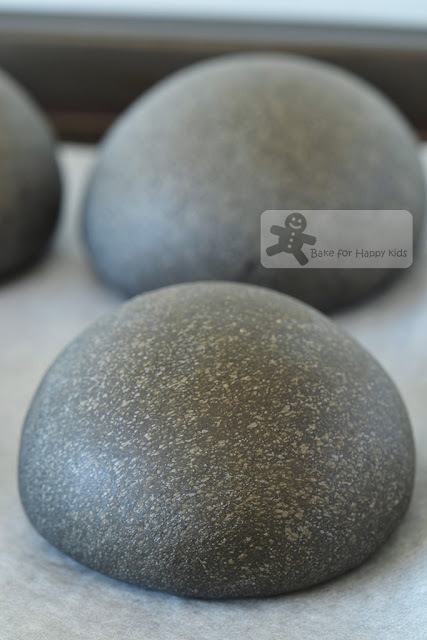 I’m really into baking unusual and uncommon breads and would love to have some of the powder.. Any advice you could help me with would be greatly appreciated.. Please do not use charcoal powder that is used for making soap. Yes that I bought mine from Singapore and I'm sure that you can try buying this food safe bamboo via US Amazon. Do I really have to knead in the bread machine for 30 mins? At whaich speed if so. Seems a long time to have the machine running. Hi Helen, Most bread dough require at least 25 mins of kneading (low speed if you are using electric mixer with a hook attachment, no specific speed if you are using a breadmaker) so that the texture will be stretchy and elastic. Cheers! Hi Zoe, would it make any difference if I do not divide the dough into 3 balls and just use one big ball to put into the loaf tin. Would there also be any difference if I do not flatten and roll it like a Swiss roll It just shape it like a ball and put it in the tin loaf.? Yes, you can do that but your sandwich loaf will not rise as tall as the ones with 3 divided portions. Cheers!